Finishing the woodpile, as I did last Wednesday, is the annual event that precipitates a collective sigh of relief in the household. Lots of equipment is required to get the job done, and if there is a failure, the outcome can be postponed. This would have been bad this year because I had already pushed it so late in the season. The day after I finished the firewood, I headed into town for the weekly errands, which chewed up the morning. Mid day was spent packing, and around 6:30, my partner and I headed to Marquette for a 3-day EMS workshop. 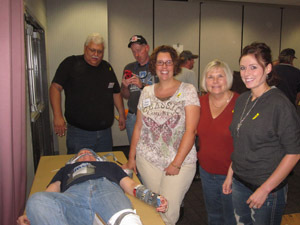 In this picture, we’re doing the practical part of a seminar called, “When Jumpkits Fail.” One member of our group (lying on the table) volunteered to be the victim, while the rest of us were given some cardboard, duct tape, magazines, bluejeans, and whatever else we happened have to save this woman’s life. Putting the bandage on her forehead with duct tape to fix a pretend laceration cause a few hair pulls after the assignment was over, but other than that she survived intact. One other session I learned a great deal from was “Airways.” I didn’t know exactly what to expect. 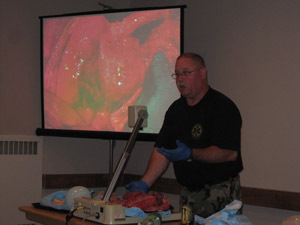 When I got there and sat down, the instructor put a pile of stuff on a document reader hooked to a projector, and showed us a pig airway. It is one thing to learn this stuff from pictures in a book, but quite another to watch the guys projecting it on a screen as he manipulated it. After the first hour, we broke up into teams of 2 and each got our own pig parts, and had some tasks including figuring out where the parts of this fellow’s heart were. We put a tube in his windpipe and used a bag to inflate the lungs. These guys also brought us the same setup but in a rabbit instead of a pig. The rabbit’s organs were supposed to be about the size of a newborn’s. It took a tiny amount of air from the bag to really inflate these little lungs. We’re told these things in training, but it is really neat to see it for real. My last class on Sunday was about operating safely on the highway, and the instructor showed us this video. While it wasn’t technically relevant to the course, it sure impressed me with how far we’ve come to make cars safe to the passengers during a crash. The video footage inside the passenger compartment was especially interesting to me. There are a lot of good apples this year, and tomorrow if the weather allows it, I’d like to start picking and processing apples. I’d like to make lots of cider, wine, apple sauce, and fruit leather again this year. The projects have piled up while the firewood was happening, and now I can finally get back to work on them. This entry was posted on Monday, September 26th, 2011 at 8:30 pm and is filed under Uncategorized. You can follow any responses to this entry through the RSS 2.0 feed. You can leave a response, or trackback from your own site.